Sometimes we struggle to make a decision. We feel stuck or trapped and desperately want to be sure of a guaranteed outcome before we decide how to proceed. Please receive that, that is what is holding you back. The fear. Fear of the unknown, fear of change, fear of a change of direction and fearing failure. Sometimes in order to move forward, in order to decide or to feel free, you MUST trust yourself for the moment. You must stop worrying about what could go wrong as it will keep you in “stuck” vibration. Sometimes, we may even need to take a few steps back, we may need to go back to the drawing board – or we may have to just risk it. Unnecessary worry is only based on a lack of self-confidence. Believe in yourself! The truth is, with every decision we make, we grow in trust. We learn to trust ourselves more and more. We gain understanding of our journey. We develop our spiritual sight, as with every change, every decision, every outcome, every curveball, every mistake, we see clearer and clearer. Release yourself from that which you feel is holding you back. Turn your fear into courage. Move away from that which no longer serves you. 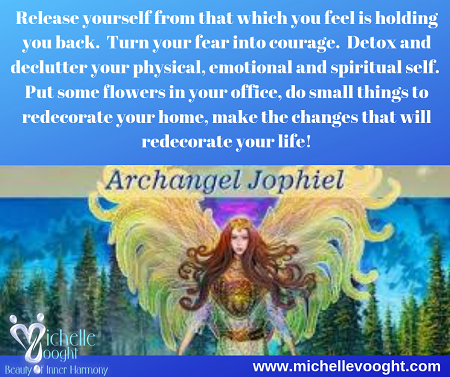 Detox and declutter your physical, emotional and spiritual beingness. Put some flowers in your office, do small things to redecorate your home, make the changes that will redecorate your life!